Voyce Health Monitor Dog Collar: image via voyce.comA new, patented, electronic collar, developed by biomedical engineers and members of the Cornell University School of Veterinary Medicine, can now monitor your dog's health and activity levels and keep you informed in very detailed, easy to understand, information and graphics on your electronic devices. It's called, appropriately, Voyce, for it tells you everything your dog would tell you if he could. 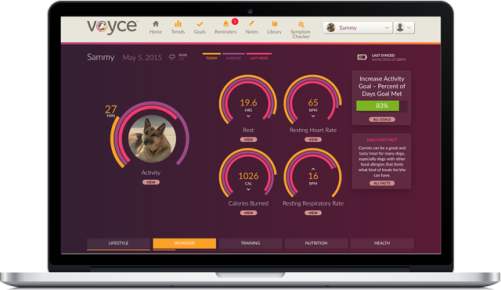 The Voyce Health Monitor tracks your pet's activity and level of intensity, quality of sleep, resting heart and respiratory rates, calories burned, and distance traveled. You can retrieve this information on the Voyce Dashboard, a website accessible on your computer or mobile device. 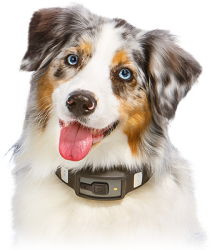 Since the Voyce collar is a 24/7 monitor, the data is compiled continuously, so you can view it by day, week, month... or whatever period of time you want. The Voyce system also interprets the data, giving you possible causes for rapid breathing or irregular heartbeat, for example. The more data you input about your pet, such as her breed, weight, age, diet, and known medical conditions, the more precise your feedback becomes. Your pet's medical records can be uploaded to the Dashboard, as well as your goals for her exercise and diet. All this information will enhance Voyce's evaluation of a health problem or need, and your dog's daily vitals will reflect whether she is reaching the goals you set for her. Dogs are not big whiners. It's not natural for them to complain as it is interpreted by other animals, particularly predators, as a sign of weakness. So, often we don't know when our dogs are ill or anxious, even though they somehow find the ability to express their resentment or sadness when we are leaving them alone at home! 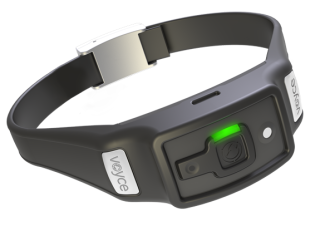 You can purchase the Voyce Health Monitor at Voyce.com.